Reverse Stamping Polishes: mix of Sinful Shine’s Kylie “Koko-Nuts” and Essie’s “All Hands On Deck” for the mermaid’s skin; Orly’s “In Summer” and Sinful Color’s “Sky Tree” for her hair; Essie’s “All Hands On Deck” Sinful Color’s “Sky Tree” and “Tokyo Pearl” and Sinful Shine’s Kylie “Koko-Nuts” on the thumb. Bling: green caviar beads, dollar store rhinestones, Hobby Lobby hotfix rhinestones, pearl and shell-ish nail charms from ebay. Okay, I’ll confess: I hadn’t meant to put as much bling as I did on my nails. 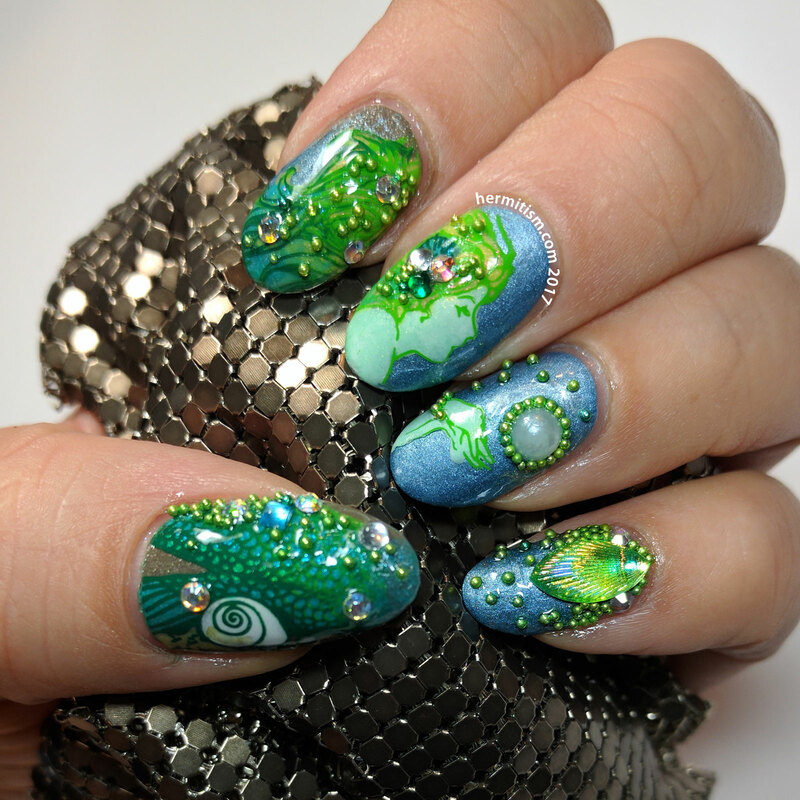 In fact, I started this manicure on Wednesday night. It was 3 AM when I glued on my two big nail charms and stumbled off to bed. When I woke up the next day, the nail art didn’t look complete. 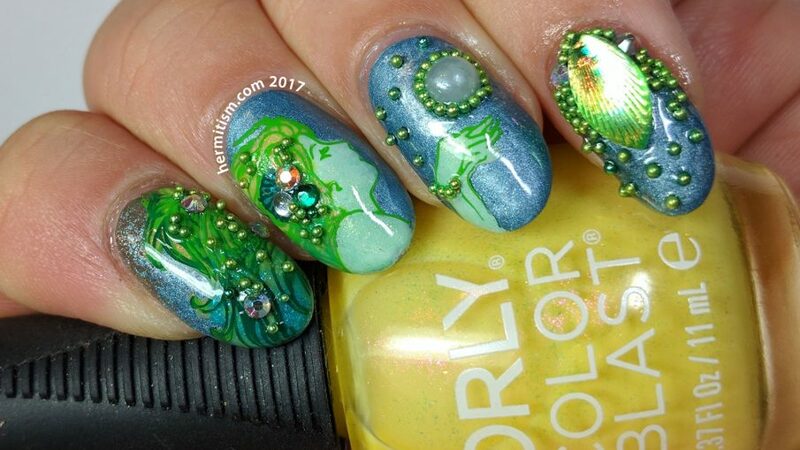 I’d accidentally cut off part of the mermaid’s tail and my fingernails were too pale compared to my thumbnail and the charms just looked like they were floating awkwardly in space and something had to be done. And so I did it. To my left hand only (my right still looks like what you see below) because I am very, very tired and I am probably going to be working overtime tomorrow and it’s 1:11 AM right now. Plus, I’m not sure my nails will survive the night with those caviar beads (the only reason I have any is because they came packaged with something else). Do you see how many asides I’ve written in just this paragraph? A clear indicator that I should stop writing now. Your narratives always make me smile. 🙂 I really love the cluster of Jews in your mermaid’s hair-‘it reminds me of those headdress popular in the 20s and it makes her look kind of Art Deco-y. 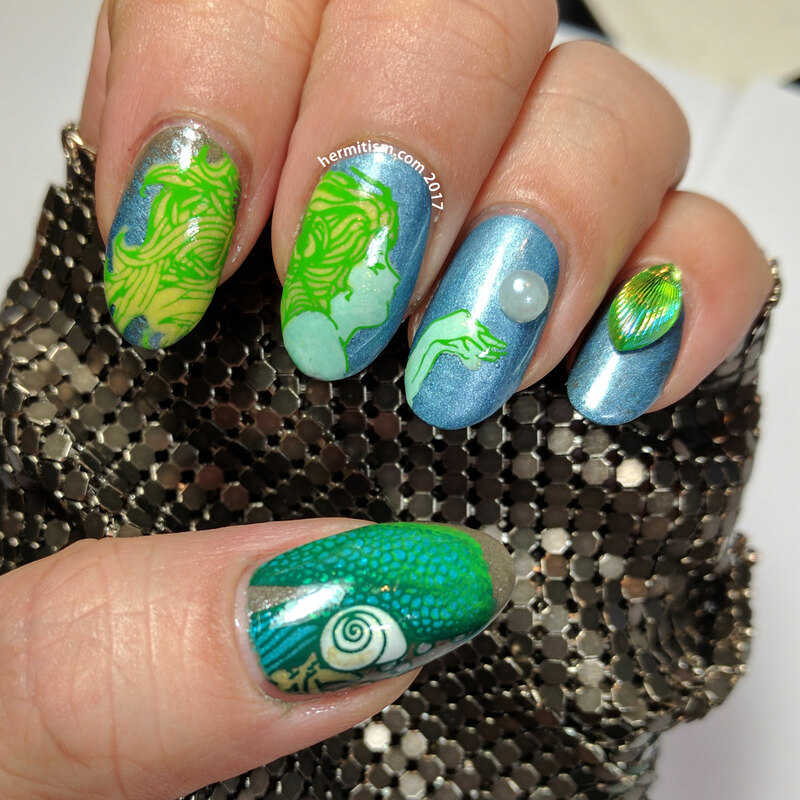 Ohhh, I love all the embellishments you added to this, the ones in the hair of the mermaid are perfection!